Member Spotlight: Meet Leslie and Robert! As visual practitioners, our field is always evolving, and as an organization, we are constantly adapting to meet the needs of our growing and diverse membership. Most shifts in our profession and organization, however, are not seismic; they are subtle. They often result from new technology, collaborative relationships, and the emergence of best practices. In order for the IFVP to sail toward the future through the subtly changing landscape of our profession, we must keep our bearings by revisiting the past and by connecting our principles to our goals. This process of reflection and connection will enable us to act with purpose and to make decisions that improve our community. We may not always make the best decisions, but if we are constantly sailing forward and constantly adapting with steady bearings, we will always have the chance to improve our course of action. 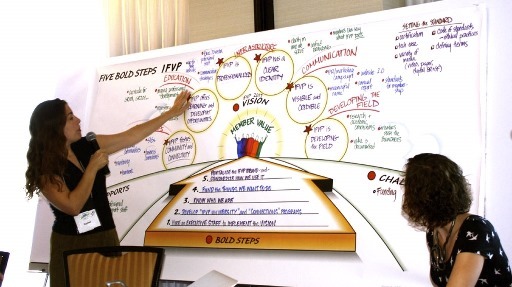 When your IFVP board met in December 2015 to plan next steps for the organization, they began by revisiting the goals set during the October 2011 strategic visioning session. When looking towards the future, members in 2011 envisioned an organization that fosters community and connectivity, that offers learning and development opportunities, that is professional, that has a clear identity, that it is visible and credible, and that it is developing the field. This 2011 vision still rings true in 2016 and informs the goals and messaging developed by your current board. The goals ring true because they are in line with organizational principles that, while formally articulated by your board in December 2015, have deep roots in the IFVP: generosity, professionalism, self-awareness, and collaboration. Because we believe in generosity, we openly share knowledge, experience, and resources with members. Because we believe in professionalism, we will establish standards and guidelines to better serve members and clients. Because we believe in self awareness, we will engage in an inquisitive way with others, being open to giving and receiving feedback. Because we are collaborative, we will engage and connect with our members and the broader community as partners and fellow thought leaders. Each of these principles supports at least one of the goals identified in 2011. By reflecting upon our past and making connections to principles that IFVP members hold dear, last December your current board developed a new mission and vision for the organization. The new mission and vision will help ensure that as an organization we are always acting with purpose in a way that improves our community. As "[w]e promote, teach, and support visual professionals and practices globally to advance community growth and development," we will be "drawing the world together to think and work better through the power of visuals." Through the 2015 strategic vision refresh, your board identified goals and strategies for fulfilling this new mission and vision that are actionable, measurable, and relevant. For example, during their December 2015 retreat the board adjusted the goals and strategies from 2011 to reflect the rapid global growth of the organization in recent years. While the importance of community growth and development is at the heart of the goals articulated in 2011 and in 2015, the refreshed goals below specifically mention the need for growth and development at the international and regional level. Community: IFVP fosters community for growth and development at the international and regional level. Connectivity: IFVP fosters connectivity for partnerships. Leadership: IFVP leads the field through visibility and credibility. 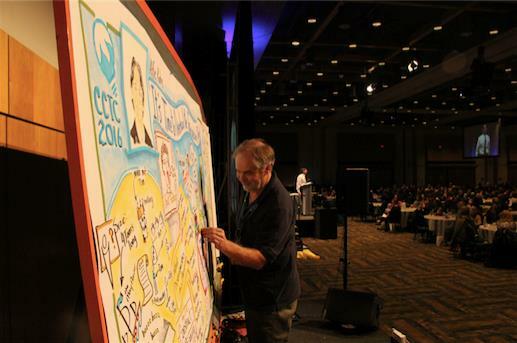 Curation: IFVP curates professional opportunities and learning opportunities for growth and development of our members. Platforms: IFVP maintains platforms required to support a virtual organization. If IFVP truly values the growth and development of our members because we think it is vital to their success, then we must also constantly strive as an organization to grow and develop. We need to see ourselves as a group of individuals who share common threads that tie together our history, our work, and our opportunities while recognizing that the organization's structure and programming is dynamic and responsive. We must not forget that greatness lies in the direction we are moving. Reenergizing the IFVP's strategic vision last December was an inspiring activity for your board. As we worked, we plugged in to the electricity that was generated by the IFVP volunteers who created version 1.0 of the strategic vision in October of 2011. We were informed by the organization's history, motivated by a desire to meet the needs of our diverse tribe, and challenged to find actionable, measurable, and relevant strategies to meet worthy goals. We take our role as representatives of the IFVP membership seriously. We come from many different walks of life. We are coaches, facilitators, teachers, recorders, and consultants. We hail from Europe, Asia, South America, Canada, and many different regions of the United States, including the northeast, northwest, southeast, and central regions of the country. We want to make sure that the diverse voices of IFVP members are heard, and the first way that we do that is by serving as a microcosm of those diverse voices. 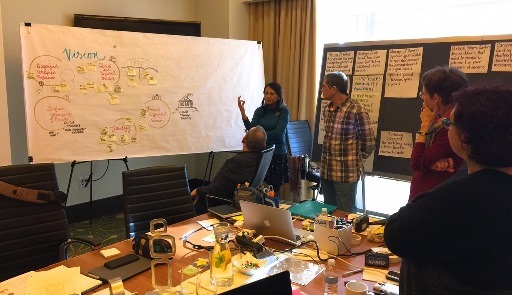 While board members brought their varied perspectives and experiences to the drawing board when we met last December to develop a mission, vision, and guiding principles for the IFVP, we need your help to bring them to life. We need your help to build upon and improve the goals and strategies the reenergized vision captures. We are an all volunteer board. While we love serving the organization and are happy to take the lead, we do not have the resources to make the IFVP all it can be without your participation, your passion, and your time. We hope you will plug in. Consider volunteering to serve on a committee or work on a project, provide feedback formally on upcoming surveys or informally by reaching out to a board member, and contribute articles and resources that can be shared on the website, on social media, or in the newsletter. Please join us as we tap into our powerful history, draw energy from our strengths, and charge towards our bright future. 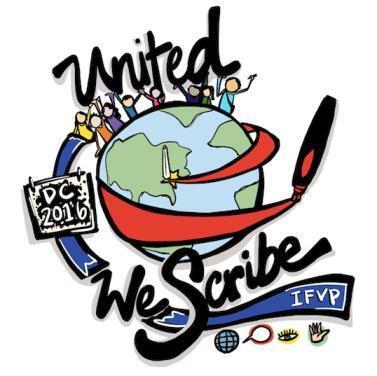 The #IFVP2016 conference theme is about much more than the location; we will succeed as a profession and as practitioners because "United We Scribe." The IFVP conference provides a unique opportunity to gather with colleagues to learn about and discuss big issues shaping our field. At this year's conference, you'll hear from Lisa Kay Solomon and Scott McCloud, keynote speakers who will bring inspiring ideas to help you keep your visual practice fresh, current and rewarding. Lisa Kay Solomon is an innovation strategist, an educator and best-selling author. Her work in design-driven strategy and leadership enables people and organizations to come up with creative solutions for complex problems. She's helped teams envision new opportunities, define disruptive growth strategies, set global innovation strategy and find other novel approaches to key challenges. Her clients include Autodesk, PBS, Audi, Citrix, Herman Miller, Citi Bank and the David and Lucile Packard foundation. Solomon teaches in the MBA in Design Strategy program at California College of the Arts, at the Stanford school and in the Kauffmann Fellows Program for Venture Capitalists. She shares her expertise in innovation theory, discovery-driven frameworks, collaborative team building and more. Moments of Impact: How to Design Strategic Conversations That Accelerate Change delivers Solomon's insight on turning ho-hum meetings and conversations to productivity powerhouses that get results. Daniel Pink lauded the book's ability to help readers "energize a team's ability to solve real problems and create new visions." Renowned cartoonist and comic book artist Scott McCloud will be sharing his profound understanding of visual language - both pictorial and typographic - and its over all impact, individually and culturally. McCloud is not only an award-winning comic artist but also a highly regarded author and presenter on visual communications. He is best known for his book Understanding Comics: The Invisible Art. Though written in 1994, the book continues to draw enthusiastic response for its relevance to creativity and design generally as well as applications to iconography, writing, website design, user experience design, photography and more. Notes one recent Amazon review, "This book is STILL a must-read for anyone and everyone interested in art, empathy, visual media of any kind, storytelling, reading, and communication." McCloud has given talks and consulted on comics and visual communications for Google, MIT, Pixar, Bloomberg, DARPA, Stanford University, the Smithsonian Institution and many other leading organizations. Join your colleagues from around the world in the DC area this summer to hear these exciting speakers and talk about implications for your visual practice. Listening to each person at such a deep level and visually illuminating what they've said to the degree that their comment, insight, idea has real impact on everyone and everything from that point forward. I knew we had a "community" when there were only 8 of us known in the world; so I founded our annual conferences which became our organization so that we might share and powerfully affect one another whether just for a moment or for a lifetime. Chicken and chocolate (dark only! ), but never on the same plate-yuck! Even as a 12 year vegetarian, I admit, I still pine for chicken...sigh. When I was a child I really enjoyed throwing a stone into a pond and watching the radiating patterns that resulted. I believe that our graphic work create those patterns in the society around us by helping people; be respectful, communicate effectively, work together better and ultimately be creative. It creates such joy I'm addicted! In my previous life with Alberta Culture I was a community development consultant and an artist on the side. I left Government to start the Positive Culture Company, Bob Horn had just published "Visual Language for the 21st Century". I was so excited I found out his phone number and called him! We had a couple of great conversations and he sent me his book - opening that book was like entering a fantasyland for me. Long story short I decided to go to IAF Toronto in 1999 to present on Visual Language and Bob told me I had to meet Jenn and Beth who would be there from a group of visual practitioners in California. I worked with Jenn again at IAF Ottawa and with a team of VPs in Minneapolis. Eventually in October 2001 Laurie and I traveled to our first IFVP meet-up and there the process to officially register the organization began. I became the first Canadian Member. Avril, your efforts have been greatly appreciated! Often people will comment that IFVP members are the most considerate and supportive group of people they have ever known. Well, it is absolutely TRUE! 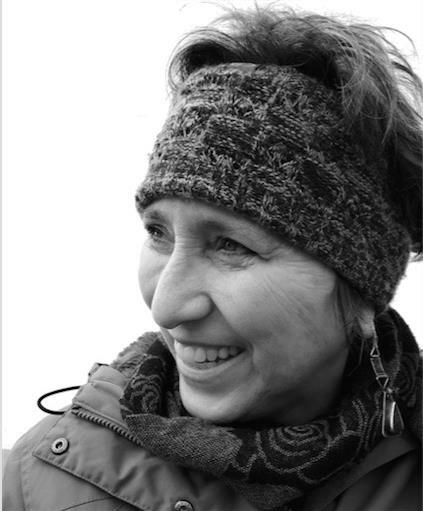 A perfect example would be our newsletter editor, Avril Orloff, who so generously raised her hand to take on the job of editor without coaxing or fanfare. She just wanted to help move the community forward in some way and she had the perfect skill set to step into that role. Avril took the lead to make certain that our membership stayed informed and plugged in. We are most grateful for her cheerful spirit, dedication and expertise in keeping our community in the "know." It has been our great pleasure to work with her and we know that she will find other ways to support all our efforts. Avril, thank you so much for your continued patience, talent and loyalty! We are a volunteer-led organization and progress solely through the commitment and talents of generous members who want to "roll up their sleeves" to advance the IFVP's mission. Now would be a great time to think about what skills you might like to contribute to move the organization forward. Would you like to be our next newsletter editor? How about lending a hand for membership? Do you have other talents that you'd like to share to enrich our community? If so, please let us know. There are countless opportunities; we are certain that we have the perfect fit for you, your passion and gifts! Please contact: Launa Post, launa@ifvp.org or +1-724-484-7700.